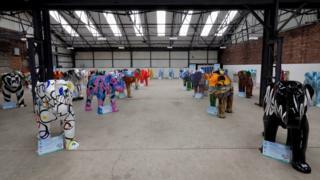 A "herd" of dozens of painted elephant statues has gone on show. The 1.6m (5ft 2in) fibreglass models - 58 in total - have been dotted around Sheffield to form the city's biggest ever public art trail. Dubbed the Herd of Sheffield, the statues have been decorated by local artists, with some featuring famous faces and scenes from the city. They will be on display until 5 October and members of the the public can follow a map or phone app to find them. After that, they will be auctioned in support of Sheffield Children's Hospital. Image caption The elephants have been designed by local artists, including Pete McKee, James Green and Lydia Monks. Charity director David Vernon Edwards said: "They look beautiful and hopefully they will bring in lots of money. "There are some really special ones and we're hopeful that we are going to get some international coverage and people will come not just from Sheffield to bid for them." Similar projects have seen Gromit statues take to the streets of Bristol, gorillas rampaging through Norwich and a flock of owls descend on Birmingham. In June a trail of about 70 smaller elephant statues decorated by schoolchildren went on show across Sheffield city centre. The elephant theme was chosen in honour of Lizzie the Indian elephant who was put to work in Sheffield during World War One.